Arctic Ice Loss: Portent of Doom or Reason to Rethink IPCC Climate Sensitivity Assumptions? “Two ice shelves that existed before Canada was settled by Europeans diminished significantly this summer, one nearly disappearing altogether, Canadian scientists say in new research,” reports an Associated Press (AP) article in the San Francisco Chronicle. 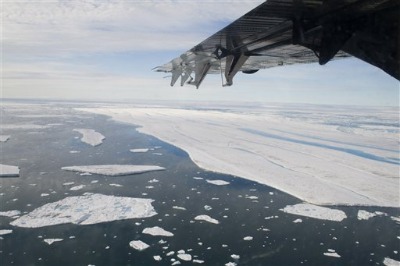 “The impact is significant and yet only a piece of the ongoing and accelerating response to warming of the Arctic,” Dr. Robert Bindschadler, emeritus scientist at NASA’s Goddard Space Center, told the AP. Not so fast, say climatologists Patrick Michaels and Chip Knappenberger, editors of World Climate Report (WCR). Paradoxically, more-rapid-than-projected Arctic ice loss is additional evidence that IPCC climate models are too “hot” — that is, overestimate climate sensitivity and forecast too much warming. In IPCC climate models, decline of Arctic sea ice is treated as both a consequence of rising greenhouse gas (GHG) concentrations and as an important “positive feedback” that amplifies the direct GHG warming effect. Al Gore popularized this idea in An Inconvenient Truth, noting that as Arctic ice melts, less solar energy is reflected back to space and more absorbed by the oceans. But, as WCR points out, if the IPCC models’ climate sensitivity estimates were correct, then the greater-than-expected positive feedback from greater-than-expected Arctic ice loss should be producing greater-than-expected global warming. Yet, despite the extra unanticipated warming influence from accelerating ice loss, the world is warming more slowly than IPCC models project. Far from being a portent of doom, greater-than-projected ice loss, coinciding as it does with smaller-than-projected warming, indicates that actual climate sensitivity is less than model-estimated sensitivity. Similarly, argues WCR in a related post, had IPCC models properly accounted for the planet’s recovery from the cooling effect of aerosols blown into the stratosphere by the Mount Pinatubo volcano eruption, they would be projecting even more warming than they do now. Yet model current projections already exceed the observed warming of the past 10-15 years. The reason that all of this is important is that climate models which produce too much warming quite possibility are doing so because they are missing important processes which act to counteract the warming pressure exerted by increasing greenhouse gas concentrations—in other words, the climate sensitivity produced by the climate models is quite possibly too high. If this proves to be the case, it means that there will be less future warming (and consequently less “climate disruption”) as greenhouse gas emissions continue to increase as a result of our use of fossil fuels. Evidence continues to mount that this is indeed the case. I think the history of Earth climates, particularly the Pleistocene Ice Ages, gives us a more reliable basis for future climate projections, than the overwarming alarmists who have been largely nullified by recent developments. 1) We have been in interglacial period #5 for 10 thousand years where the world’s climate has warmed and cooled about 4 deg C several times. Our present warm up from the Little Ice Age began around 1300 AD, peaked around 1940 and has warmed very little since. The myth of recent unpresidented global warming never happened. Today our tropics are only 4 deg C warmer than they were 23 thousand years ago at the last glacial maximum. As long as we have ice in our polar regions we remain vulnerable to another 100, 000 year glaciation. Our sun is at times insufficient to prevent another major ice age and the only thing preventing the Earth icing to the equator is a robust Greenhouse Gas, which has happened twice in the distant past before any life had formed on land. The hard truth is that it is our demonized greenhouse gases are the the only thing preventing another snowball earth and our EPA is eager to begin reducing them to a bare minimum. Therefore, the geologic history of the Earth is overwhelmingly in favor of a warmer climate that existed during the age of the dinosaurs. Post image for Arctic Ice Loss: Portent of Doom or Reason to Rethink IPCC Climate Sensitivity Assumptions? Previous post: Inspector General Report on EPA Endangerment Finding: Did Agency Outsource its Judgment?